Next to Walking street, Beach Road and adjacent to 7-Eleven, this hotel is perfect for all kind of travelers and offers good value for your money. There are lots of Indian restaurants close by and the hotel also serves Indian food. Within the hotel, you have a mini bar, an amazing pool and the staff is particularly helpful in making your stay comfortable. 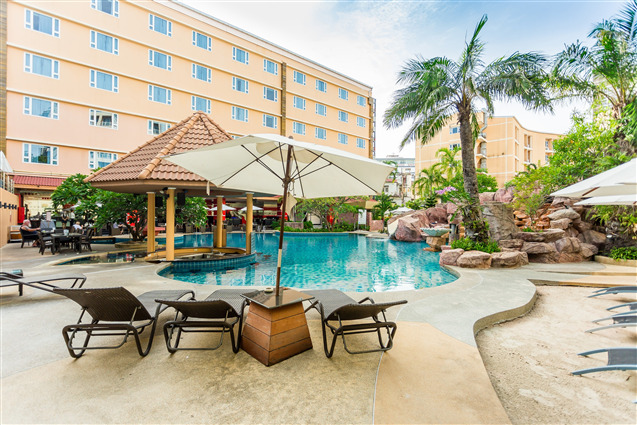 Nova Platinum Hotel Pattaya is a modern-day 4-star property which is situated close to the Walking Street and Pattaya Bay. Being situated in a beautiful ambiance, the hotel is the perfect accommodation for both business travelers and leisure travelers. 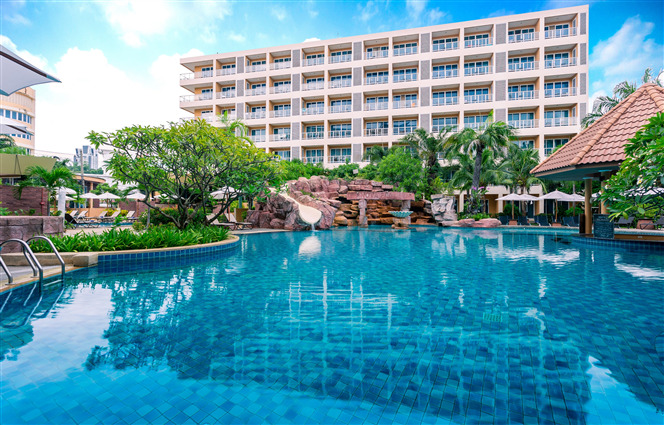 Nova Platinum Hotel Pattaya features a spacious garden as well as a large swimming pool with a waterslide. The hotel also has in-house restaurants, pool bar, meeting room, and a special occasion hall. The in-house fitness center has a range of exercise equipment while the in-house spa center, which is known as Sukavadee Spa, offers the massage treatments in the Premium Wing. With warm lighting and tasteful furnishings, the hotel offers warm hospitality and calm atmosphere. The hotel is also near to many famous tourist attractions. 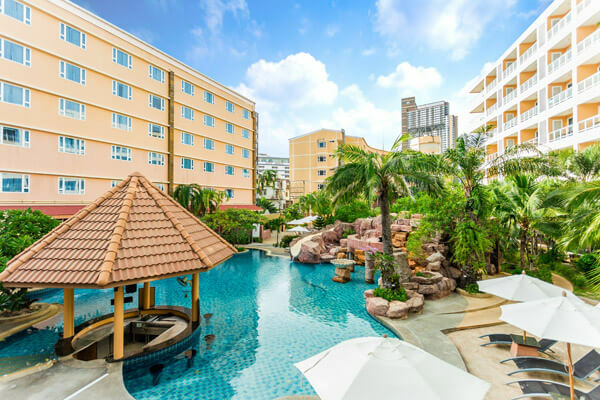 Further, Nova Platinum Hotel Pattaya is a 45-minute drive from the U-Tapao Rayong-Pattaya International Airport and a 5-minute walk from the Cosy Beach. 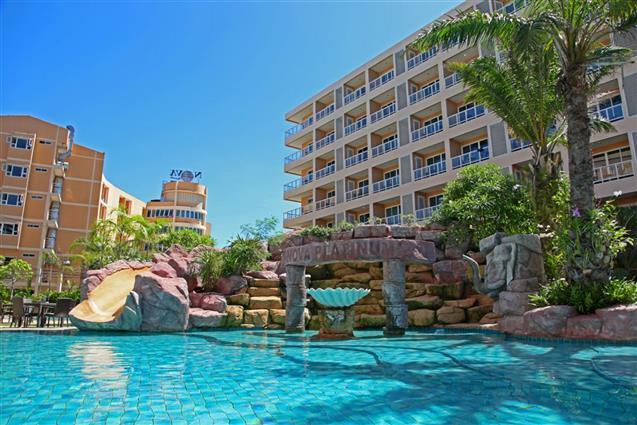 Nova Platinum Hotel Pattaya Thailand is a classic combination of contemporary Thai decoration and world-class services. The hotel has 3 buildings with well-designed 270 rooms. All the rooms have an individual balcony while some have separate terrace too overlooking the lush green garden and large swimming pool. 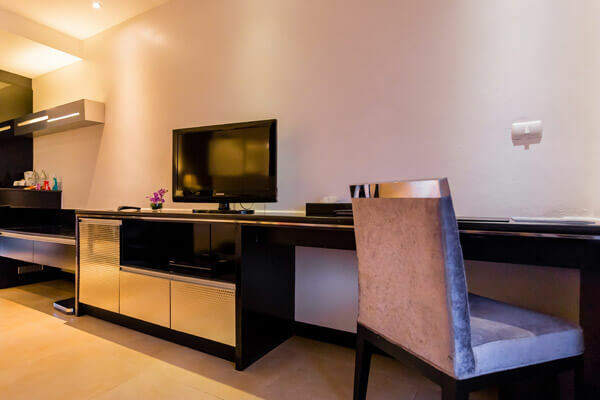 The modern furnishings of the rooms complement the whole setting of the hotel. Each room has an air-conditioner, bed, water dispenser, mini bar, mini-fridge, balcony, television, fully-furnished bathroom and an in-room safe. The rooms are spacious and airy and come with large windows. Each room is well-furnished and comes with all the necessary amenities and services. Nova Platinum Hotel has 3 buildings with a total of 270 well-equipped rooms. The hotel offers immaculate services and all the essential facilities to refresh the travelers. The hotel also maintains a large freeform swimming pool, which is surrounded by the lush green gardens. It is the perfect oasis for the guests to retreat. Guests can enjoy the waterslide, relax in Jacuzzis and can exercise in the lap pool. There is also a fitness center for all the gym enthusiasts and an in-house spa center, namely Sukavadee Spa, which provides various massage treatments. The property also maintains a meeting room for business travelers. The other features are free Wi-Fi, babysitting service, concierge service, banqueting facility, laundry service, 24-hour front desk, airport shuttle service, currency exchange service, medical service, and luggage storage. Nova Platinum Hotel features two restaurants and one pool bar. The in-house restaurants give a chance to savor most of the popular and delectable dishes while the bar allows the guests to relax, refresh and enjoy the cool drinks at the poolside. Kiara Restaurant offers the delectable and well-prepared American buffet breakfast. It opens from 6 am to 11 am. Zia Restaurant is an all-day dining eatery and offers a wonderful selection of Thai and International cuisines. It serves the delicious three-time meal and opens from 6 am to 11 pm. The in-house pool bar offers the guests to indulge in the wide array of cool beverages and light snacks. With the professional and friendly staff, Nova Platinum Hotel provides impeccable services, modern facilities, and warm hospitality. Being situated near to the numerous shopping arcades and tourist attractions, this hotel will definitely keep its guests engaged and they will enjoy their stay. How much time will it take to reach the hotel from the International Airport? 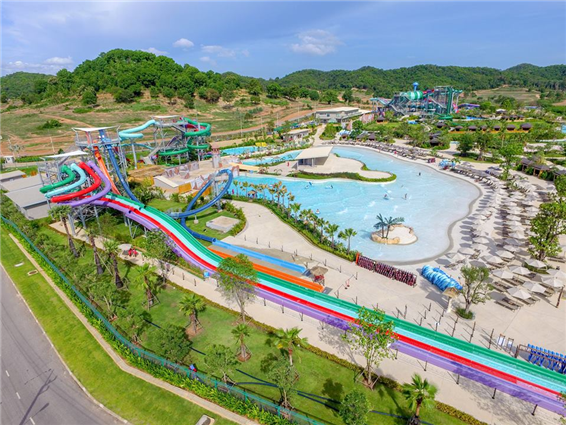 The hotel is roughly a 45-minute drive away from the U-Tapao Rayong-Pattaya International Airport. Is there any pickup up service from the airport to the Nova Platinum Hotel? Yes, Nova Platinum Hotel Pattaya Thailand offers airport shuttle services to all the guests. What recreational activities can be enjoyed in and nearby the hotel? Guests can enjoy the swimming in the outdoor pool or can exercise in the lap pool, enjoy the waterslide and can relax in the Jacuzzi. Even, tourists can explore the nearby places through the city tours arranged by the hotel and can buy the souvenirs from the nearby markets. Is the breakfast free of cost at Nova Platinum Hotel? Does Nova Platinum Hotel offer luggage storage services? Yes, the hotel offers a luggage storage facility to all its guests for their convenience. Nova Platinum Hotel Pattaya Thailand offers prominent facilities and amazing services to all the guests. This 4-star property has an outdoor freeform swimming pool, waterslide, Jacuzzis, lap pool and spacious rooms. All the rooms feature private balcony and terrace overlooking the lush tropical garden. The hotel also maintains two in-house restaurants namely Kiara and Ziva and a pool bar. Kiara serves buffet breakfast and Ziva serves a full three-time meal while the pool bar offers cool beverages and light snacks by poolside. The restaurants serve the delectable and luscious Thai and other International cuisines. The hotel is a blend of modern Thai decor and contemporary luxury. Visitors can explore the town through the city tours arranged by the hotels tour desk. With lavish and comfort, Nova Platinum Hotel Pattaya Thailand fulfills all the needs of its guests and is a value for money property. One is sure to have a cherishable holiday experience at the Nova Platinum Hotel.